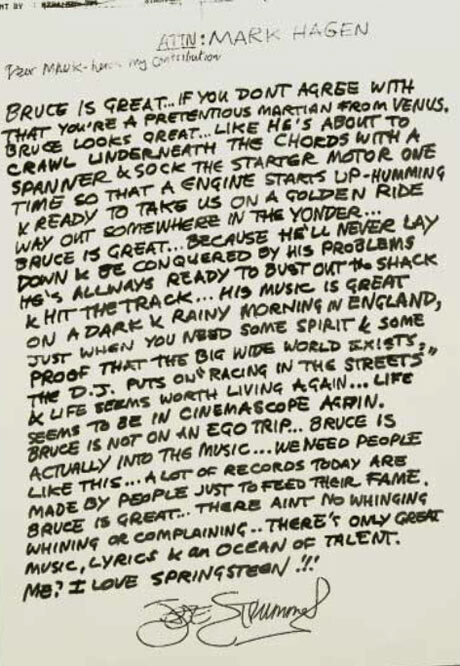 When, in 1995, the great Joe Strummer was asked by Mark Hagen to contribute to a Mojo article on Bruce Springsteen, he responded enthusiastically with the fantastic fax seen below. I think it's fair to say he was a fan. 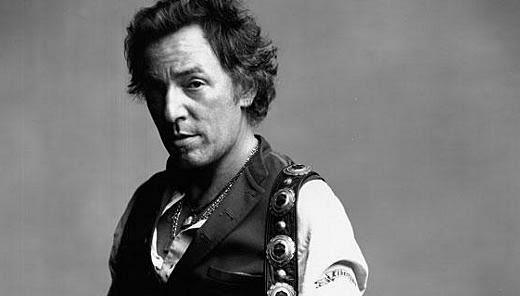 The Boss publicly returned the compliment during a gig in 2008, declaring Strummer "one of the greatest rockers of all time" before launching into a rendition of I Fought the Law. BRUCE IS GREAT... IF YOU DONT AGREE WITH THAT YOU'RE A PRETENTIOUS MARTIAN FROM VENUS. BRUCE LOOKS GREAT... LIKE HE'S ABOUT TO CRAWL UNDERNEATH THE CHORDS WITH A SPANNER & SOCK THE STARTER MOTOR ONE TIME SO THAT A ENGINE STARTS UP - HUMMING & READY TO TAKE US ON A GOLDEN RIDE WAY OUT SOMEWHERE IN THE YONDER... BRUCE IS GREAT... BECAUSE HE'LL NEVER LAY DOWN & BE CONQUERED BY HIS PROBLEMS HE'S ALLWAYS READY TO BUST OUT the SHACK & HIT THE TRACK... HIS MUSIC IS GREAT ON A DARK & RAINY MORNING IN ENGLAND, JUST WHEN YOU NEED SOME SPIRIT & SOME PROOF THAT THE BIG WIDE WORLD EXISTS, THE D.J. PUTS ON "RACING IN THE STREETS" & LIFE SEEMS WORTH LIVING AGAIN... LIFE SEEMS TO BE IN CINEMASCOPE AGAIN. BRUCE IS NOT ON AN EGO TRIP... BRUCE IS ACTUALLY INTO THE MUSIC... WE NEED PEOPLE LIKE THIS... A LOT OF RECORDS TODAY ARE MADE BY PEOPLE JUST TO FEED THEIR FAME. BRUCE IS GREAT... THERE AINT NO WHINGING WHINING OR COMPLAINING.. THERE'S ONLY GREAT MUSIC, LYRICS & AN OCEAN OF TALENT. ME? 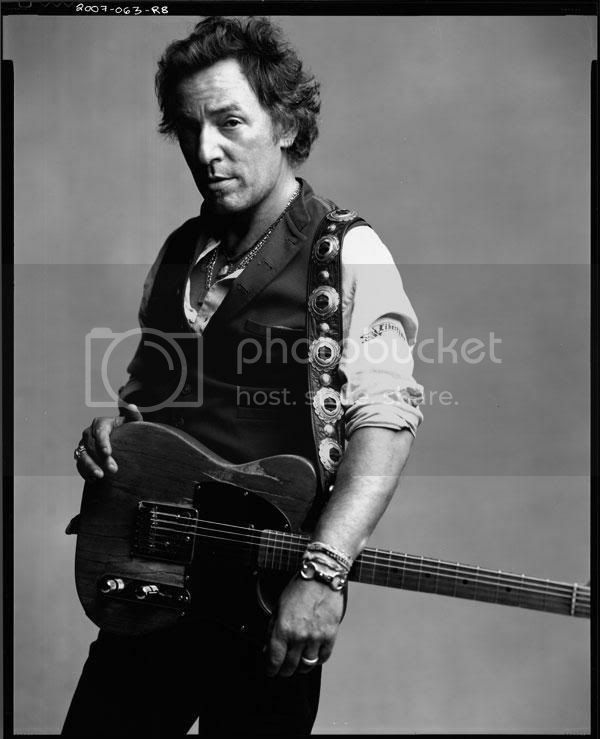 I LOVE SPRINGSTEEN!! !